"modern and chic with a homely and relaxed atmosphere"
Pomodoro restaurant originally started four years ago in Rivonia, then known as the Pomodoro Ristorante, and has now relocated to the Morningside shopping centre in Sandton on Rivonia road. 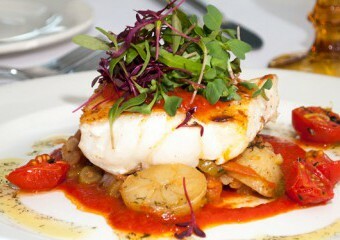 Set in fresh and modern surroundings, the Pomodoro restaurant charms with its informal and homely atmosphere. The new contemporary menu features tasty Italian food, grills, delicious seafood, tapas and light lunch meals. Favourites among diners are our pizzas and scrumptious mozzarella loaves. All our ingredients are freshly sourced and only the finest quality of fish and meat are served. Watch out for our all-new lunch and specials menu which includes a tangy variety of salads and starter/tapas as well as one-course meals allowing diners to savour our tasty cuisine without spending a fortune. Pomodoro restaurant have recently added a pre-prepared takeaway deli menu which includes, Lasagna, Cannelloni, Melanzane alla Parmigiana, Italian roasts and other delights such as golden olive oils, fresh pastas and other Italian goods. Bring the great tastes of Pomodoro into your own home and treat your guests to a traditional Italian dinner party. Pomodoro restaurant in Morningside continue to offer their guests an enjoyable meal of outstanding quality coupled with impeccable service.